Easily the funkiest place in town, the Watson Art Centre (WAC) is a Provincial Heritage Site and plays host to countless concerts, exhibits, spoken word and other special events each year. From their annual Concert Series to their Old Fire Hall shows the WAC Programming Committee presents an impressive, always eclectic, always entertaining line-up with wide appeal! 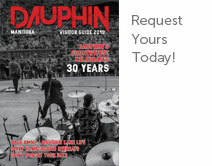 Check Tourism Dauphin’s Event Calendar for show times. The WAC is also home to Made in the Parkland: this is the best place in Dauphin to find one-of-kind gifts and merchandise…all made by local artisans. Paintings, pottery, candles, music and books are just a few examples of the treasures waiting to by discovered! HISTORY of the Watson Art Centre: Formally known as the Dr. Vernon L. Watson Arts Centre and designed and constructed by Dauphin architect, contractor and politician Stuart Geekie, this grand Romanesque Revival brick building was built as the Town Hall in 1905, housing the fire station and RCMP detachment. Through the years this multipurpose building has seen a variety of uses and changes. Many organizations have shared space within its walls including the local library, Scout group, Dauphin community bands, a public restroom and ARC Industries. The Dauphin and District Allied Arts Council assumed management of the building in January 1973and the Watson Art Centre has been the centre of Dauphin’s art scene and a meeting place ever since. Currently, it houses an art gallery, art and pottery studios, a ballet room, meeting rooms and a ball room. Thanks to its Provincial Heritage Site designation and recognition as a heritage site by the City of Dauphin, both structural and cosmetic alterations have retained the historic nature of the building.